One of the best superhero films, this one really works as an origin story that explains how a man who takes on the mantle of a superhero could come to be. This is a fantastic superhero movie that isn’t afraid to get psychological and take the time to really develop a character before giving us the superhero. We don’t even meet Batman until roughly the second half of the film. That’s because director Christopher Nolan knows that if we are to buy into all this and believe that a Batman could really exist, then we have to first understand the forces that would lead to his creation. There’s the way that a fear of bats, stemming from Wayne as a child, lead to what he sees during a play, that end up making his parents leave the performance, go out into an alley and get killed. There’s the idea that Bruce Wayne’s fear of bats is what he plans to use against his enemies. There is a long training storyline, where Wayne develops his skills by working with The League of Shadows. And then there is Lucious Fox, the supplies and weaponry man, who takes Wayne over the practical uses of his equipment, before Wayne puts them to use as the caped crusader. This movie is smart in so many ways, inlcuding the way it has multiple villains and spins one of them into the next, with a continuous storyline. How many superhero movies try to cram too many villains in and end up a mess as a result of it? This movie actually does it right, having one storyline lead to another, instead of trying to balance them all at the exact same time. This is the superhero movie that takes the time to get us on board and believing in everything, and all of that really pays off. Batman Begins is absolutely one of the best superhero movies ever made. It’s pretty much this film and Iron Man. While Heath Ledger’s Joker in The Dark Knight is most certainly the greatest superhero villain or performance in a superhero movie, that film just got too far off the rails with Two Face in the final act. Batman Begins has none of that. What it does have is a lot in common with Iron Man, both featuring a lenghty story that builds up to how the superhero came to be, instead of in any way rushing into it. 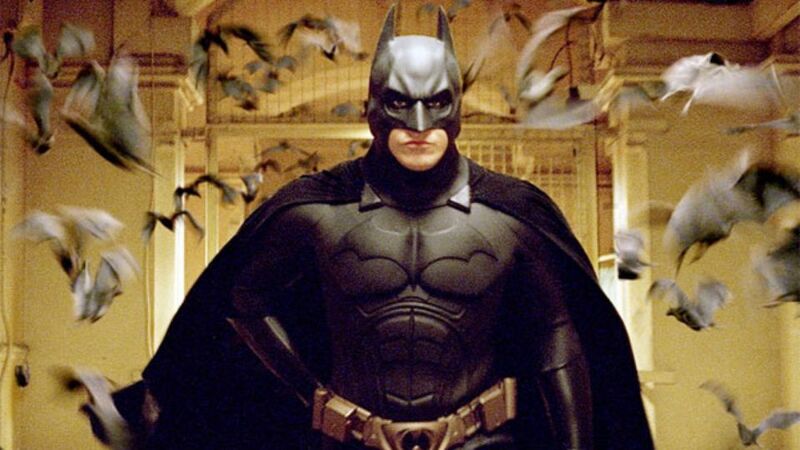 Both Batman Begins and Iron Man have our hero spend time in a foreign country and deal with enemies there, who forever alter his life, in such a way that when he returns home, he begins developing the superhero outfit. In Iron Man, Tony Stark was kidnapped and held prisoner. In Batman Begins, Batman goes through training with the League of Shadows organization. This movie gives us a lot of back story in a small amount of time and it does that by alternating between the League of Shadows story and the story of a young Bruce Wayne and his parents, getting mugged in an alley, and his parents being murdered. The Wayne parents murder is a very famous scene that has been done time and again in nearly every Batman film (well, series of films,) but it is never given more attention than it is in this movie. The same goes for his father. While the mother isn’t seen much in the movie, and perhaps that’s a commentary on her relationship with Bruce, or lack thereof, his father, Thomas Wayne, has a pretty big presense here, having talks with Bruce and passing out advice on a regular basis. In fact, proof of how much better Bruce’s relationship is with his father than it is with his mother comes during the play. Bruce gets scared and wants to leave, and he asks his father. When his mother is unhappy with Bruce, his father takes the blame, saying he needed to get some air. All of this is interspersed with scenes of Wayne in jail, over in Bhutan, Asia. He fights it out with prisoners in the courtyard and receives an invitation from a visitor to his cell. This is Henry Ducard, (Liam Neeson,) who invites Wayne to join the League of Shadows after he is released from prison. The next day, Wayne is released, and climbs a mountain to find the temple of the League. He joins them, under the tutelage of Rhas Al Ghul (Ken Wantanabe.) Here there are many excellent lessons and training exercises. There’s a lot about theatricality and deception and how to use these things as weapons against the enemy. You can see the tools that will become part of Batman lore, building up, bit by bit. These include the spiked wrist guards that men wear, while in the League. With all the cool training, and traveling the world, and ninja fights, there is one problem with these early scenes. The devotion of the League to destroy Gotham. It seems a little ridiculous. Imagine being in a small part of Asia, where people barely spoke English, and all anyone could talk about was New York. You would think these people would have other things on their mind than destroying a city. And I have no problem with the League showing up to Gotham later on in the movie, to enact their plan, but just hearing how much it was spoken of here seemed out of place. At least we got a cool speech about the League being responsible for sacking Rome and burning London, as part of their accomplishments throughout history, out of it. We also get flashbacks of Wayne returning home from college to find the man who killed his parents making a deal with the District Attourney and getting released on parole. This leads to Wayne paying a visit to crime boss Carmine Falcone, (played wonderfully by Tom Wilkinson,) and that leads to his trip to Asia. What’s cool about all this is that it leaves no questions unanswered. We now see how Wayne ended up in Asia, what happened to the man who killed his parents, and start learning about characters who will come into play later on, such as Alfered, Rachel, and Falcone. Like Iron Man, the other thing that makes this movie especially cool is the way it takes time to develop the suit and weaponry of the hero. Movies that either don’t show us these things or just rush over them expect us to believe that the man basically created all of his gadgets overnight. I love the Iron Man evolution of the armored outfits, as well as the flying tests, like one where Tony Stark ends up slamming backwards into the ceiling. In Batman Begins, the humor isn’t there, but the attention to detail about how everything works certainly is. The memory cloth that he uses as a cape, which can take one shapes when a current runs through it, is fantastic. So is the armor. There are a number of conversation about the bat ears and how they break off. And then there’s the Batmobile which is exceptionally cool. I even love the conversations about bats and why Wayne has chosen to use a bat for his persona. He tells Alfered that he is afraid of bats and now plans to make his enemies afraid of them too. There’s even a wonderful scene where Batman attacks Arkham Asylum, where drugs are being poured into the water stream, and a SWAT team shows up to go after him. Batman employs a whole ton of bats, using a sort of sonar sound system that he keeps in his boot, and they flood the place. It’s a really clever moment, and especially cool the way he can turn the attention of the bats on and off. The action here is fantastic, including the best Batmobile chase scene ever put on film. “He’s flying on rooftops.” This Batmobile flattens cars on the road without any hesitation. And there’s also a very interesting storyline with the villains. There are three of them, (four if you count the man who is trying to shut Wayne out of his company, played by Rutger Hauer,) but the three criminal villains are all connected. There’s Falcone who runs the illegal trafficking activity in the city. He is bringing in drugs for a man named Crane, better known as the Scarecrow. And the Scarecrow is working for our third villain, who shows up in the final acts of the film. It’s a tough feat, juggling more than one villain in a film, and this movie does it perfectly, bridging them all together through the storyline, and basically passing one of into the next, so that each one represents a part of the movie. In other words, at no point of the movie are all three of them the main villain (or even two of them.) Instead, each one stands for a different section of the film. 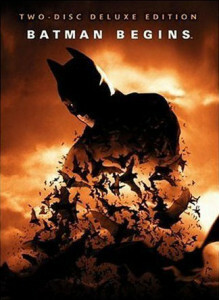 Batman Begins is a wonderful movie. It is incredibly dark, but also details and compelling in all the right ways. There are a few flaws, most of them minor, (Katie Holmes as Rachel Dawes doesn’t really bring anything to the table.) What definitely works about the film is the way that it tries to explain and justify everything. Usually it’s Lucius Fox, (Morgan Freeman,) doing the explaining, and you can’t get a much more convincing actor than him. Even when he’s talking about a micorwave emitter vaporizing the enemies water supply, he makes it sound like poisoning the water, and not what it really is, which is turning the water into water vapor in the air, and having the poison inside of it spread to people who breathe it in. This is the kind of idea that is so ridiculous, it is right up there with The Riddler’s brainwaves brainwashing in Batman Forever, and yet in the hands of Christopher Nolan and Morgan Freeman, it actually sounds believable. 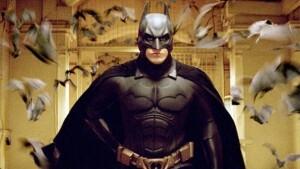 Nolan is a fantastic director, and was absolutely the perfect choice to direct this film. Back when he made this movie, he was coming off Memento and Insomnia, and was on a role with his mind bending films. After this movie, he continued his streak with The Prestige and Inception. Basically Nolan was at the top of his game when he made this movie, and it shows.